Can you guarantee us that the language of the Public Land Initiative bill isn't manipulated when it goes through the Senate? What are Senator Lee's thoughts on the Public Land Initiative and how to get it passed? What are your thoughts on rancher rights concerning the Public Land Initiative and the Oregon refuge situation? 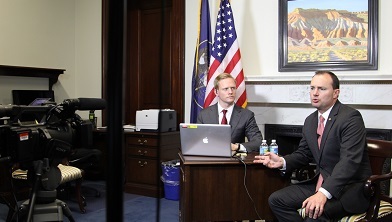 As part of Utah Senator Mike Lee's plan to host interactive events with every county in Utah, Senator Lee hosted this live, interactive event with the residents of the Uintah Basin. Senator Lee's goal in hosting this event was to learn more about the specific issues affecting those who live in the rural counties of the Uintah Basin. He spoke about public land management, natural resource development, and other rural issues.